Lullingstone Castle was originally a medieval manorial complex, founded by the Rokesle family. A manor house approached via two gatehouse and encased by an inner embattled wall and a moat, was possibly founded in the late 15th century by John Peche or between 1543 and 1580 by Sir Percyvall Hart. In the 18th century the house was given its Queen Anne style facade and Sir John Dixon Dyke demolished the inner gatehouse and filled in the moat. Originally called Lullingstone Park the title of 'castle' was transferred from Shoreham Castle in 1715. Portions of the Tudor manor house survive on the north and east fronts, as well as the outer gatehouse. Brick-built, rectangular in plan and crowned by a machicolation and castellated parapet, the carriage archway with a room over is flanked by three storey polygonal turrets. A mile north-east is Eynsford Castle. 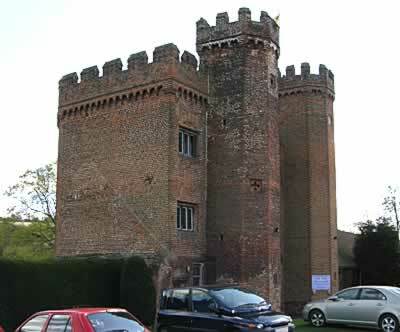 Lullingstone Castle is located in the village centre, off Lillingstone Lane. 7 miles north of Sevenoaks, on the A225. The site is owned by the Hart Dyke family and the house is open at 2:00pm for a guided tour, April to September, Friday (except Good Friday) to Sunday, Bank Holiday Weekends 12:00-5:00pm and special events 11:00-4:00pm, Wednesday and Thursday for groups by arrangement. The World Garden is open, Fridays (except Good Friday) to Sundays and Bank Holiday Mondays 12:00-5:00pm. The site is visible from Lillingstone Lane.